Description: Colt Super 38 Government Model Semi-Auto Pistol serial #CS002015, 38 Super Auto, 5" barrel with an excellent bore. This lovely 1969 made pistol retains about 99% original blue that is toning to plum on the slide along with minor high edge wear and a few handling marks. 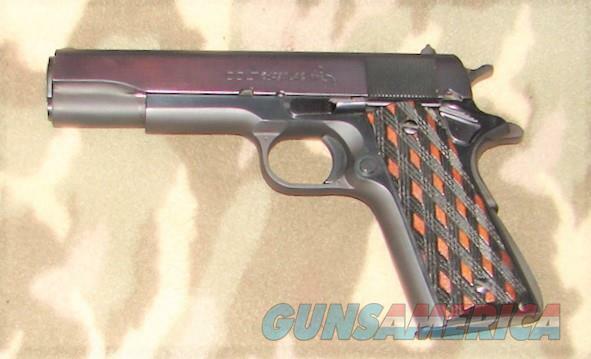 The unmarked replacement skip line checkered aftermarket grips rate excellent. This pistol also includes a wood grain factory box correctly end labeled, but not correctly numbered, to the gun (#CS002211), a single magazine and manual. The box rates near excellent with scattered edge wear and a few scuffs. The gun appears to have seen only minimal use over the years.